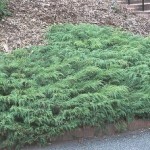 A wide spreading groundcover with bright green, scale-like leaves. The foliage turns coppery-brown in winter. Will take sun or light shade. Not too fussy about the soil type, as long as it is well-drained.